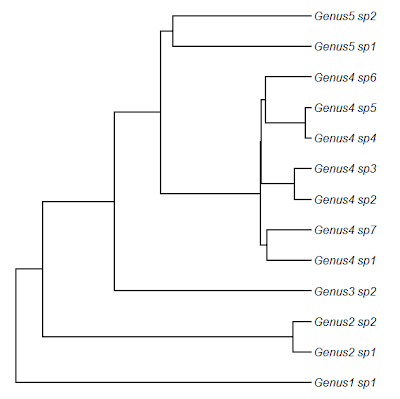 "I need to add a list of 230 species in a phylogenetic tree. Is there a logical way to add the species to the root of the genera to which it belongs, in a systematic way, that is, to make a function recognizes the name of the genera to which the species belongs, and so it adds the species to that root?" I posted a solution to this, but I also thought that other phytools users might face the same problem so I have now automated this in the function add.species.to.genus. This, along with the matrix comparison function skewers, is also in a new minor phytools build (phytools 0.3-73). 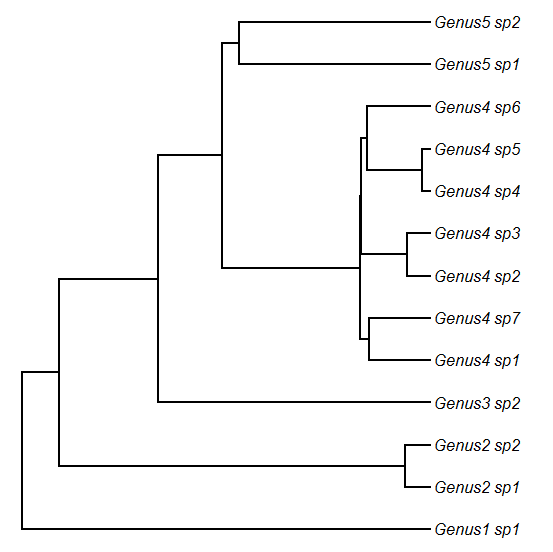 The function works by first peeling the genus name out of the species name. It does this by looking for either the underscore character, "_", or a space character, " ". 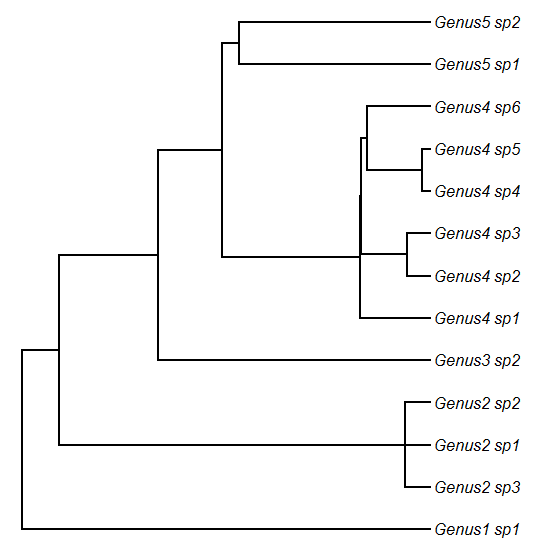 It then proceeds to identify the clade containing con-generics in the tree by matching the genus name to the tip labels. 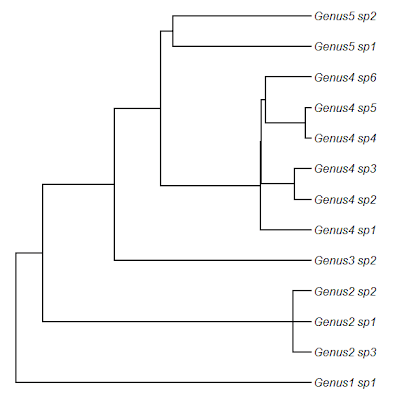 Finally, it can either attach the new species to the root node of the most inclusive clade containing congenerics; or it can attach the new species randomly within that clade. In general, the function works best if the input tree is ultrametric. Otherwise, it may return a tree without edge lengths! 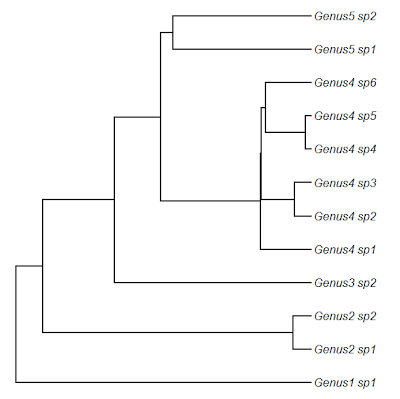 If the user supplies a species name for a genus with only one representative in the tree; a species with no congeners in the tree; or a genus that is non-monophyletic, in each case the function will try to do something rational and return a warning. I am trying to use the add.species.to.genus function, but I am having trouble getting the correct result. 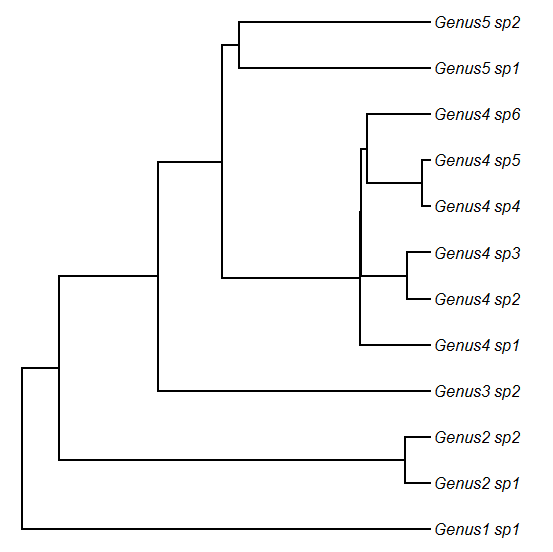 The function is only adding the last species of a vector to the phylogeny. Here is my code below and any comment(s) that you can give would be great. Otherwise you will not be updating the tree every loop. Thanks Liam, I appreciate your help! 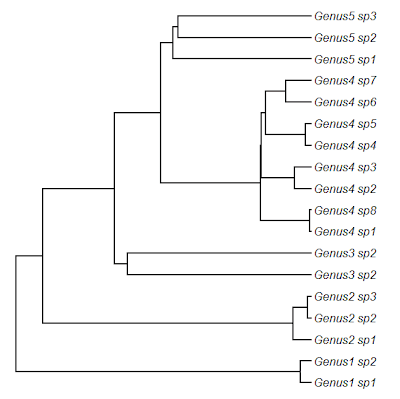 Would it be possible to - instead of inserting taxa inside the clade, i.e. above the empirical MCRA - could one define a maximum age above which new taxa could be inserted? Reason I ask is, if you have a genus that is grossly under-sampled and the few species you have are closely related, the MRCA will be quite young and all inserted taxa will be crammed into this short time-frame, which might be unrealistic. 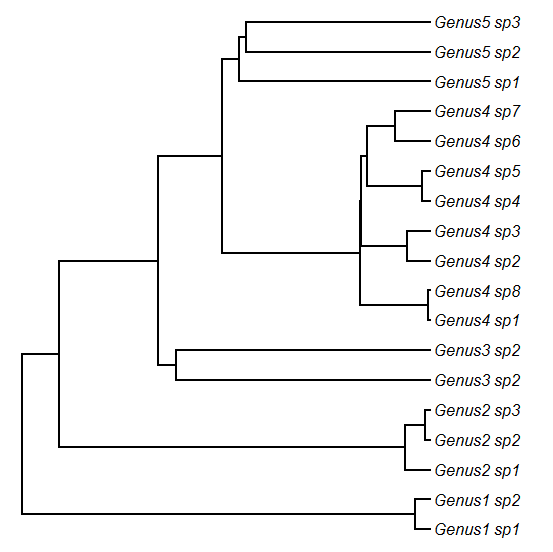 The tree has apparently singleton node(s): cannot read tree file. If I understand well "add.species.to.genus" uses read.tree() to read the tree instead of the read.newick() function, hence singletons in my original tree become a problem at this point. Am I right? If so, what should I do? Should I edit my tree to becorrectly readed by read.tree() first? or there is a way to modify arguments in add.species.to.genus() to use read.newick() instead? Not sure, but that might work. I am having the same problem (If I understood your). I am adding some species in an a tree (that I transformed in ultrametric before), but in some moment the function returns a error message that the tree is not ultrametric.I don't know how I can solve this. I was wondering if you had a reply to Ryan and Rodrigo's problem, as I seem to be running into the same issue. Thank you so much for your help.